At least for around 15 minutes. Then I noticed a strange rattling. Upon further investigation, I discovered a busted spoke. Damn. 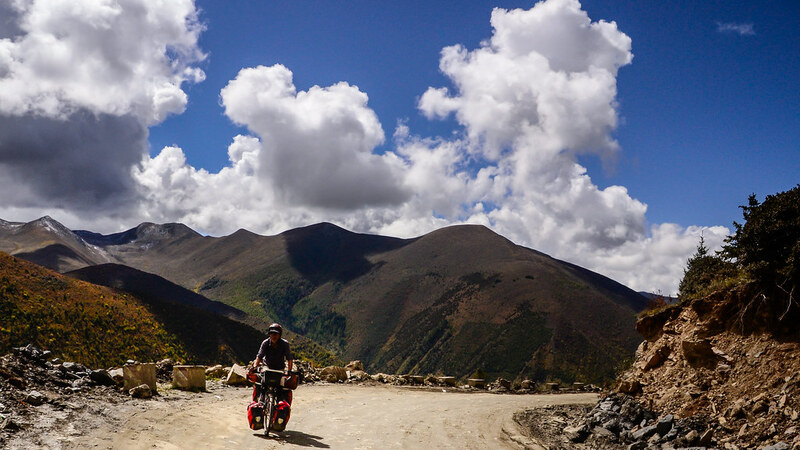 The most demanding section of our Tibet ride lay ahead. 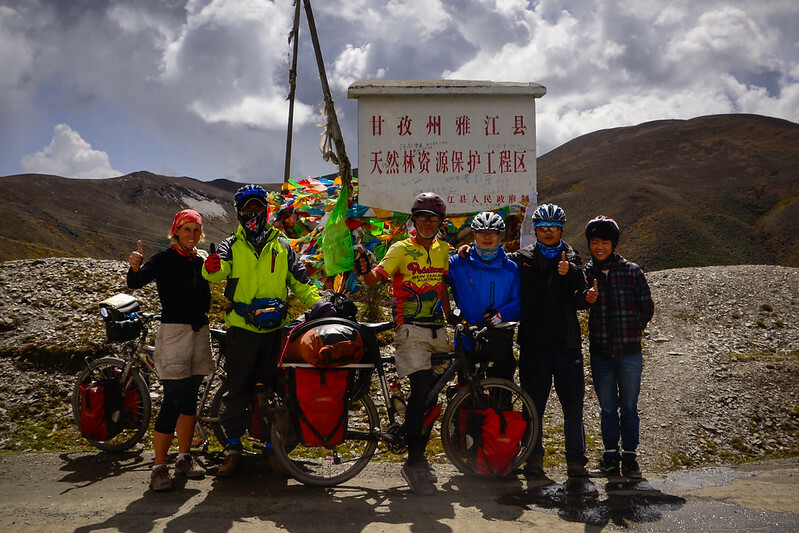 An arduous route over 4 passes–all with altitudes around 4,300 meters– separated us from the next big town, Yajiang. I’d psyched myself up for the ride, repeating over and over in my mind that we’d just take it slow and everything would be all right. Truth be told, I was entirely convinced. More mechanical troubles were the last thing we needed. On this one occasion we actually appreciated the fact that China is swarming with construction crews. Normally the high rise apartment blocks springing up in once empty pasture land, the roads being carved through the countryside and the cranes dotting the skyline of previously sleepy backwaters leave us gloomy and despondent. Not today. Just above Litang town a new tunnel is being blasted through the mountains. The place is a hive of activity, with hundreds of workers milling about. These workers had tools! We were rescued. The guys lent us a wrench and within a few minutes, Eric had pried open the cassette and got busy fitting a new spoke. No one paid us much attention as Eric tinkered with the bike. Two-wheeled tourists are a regular sight in this part of China. Of course most don’t look like us. 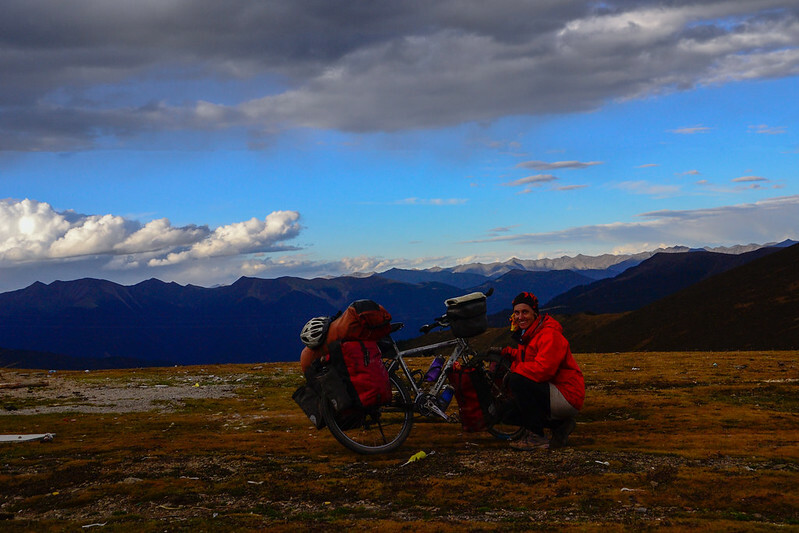 Your typical long-distance cyclist here is a fresh-faced Chinese university student pedaling to Lhasa. Disheveled middle-aged foreigners are relatively rare. Local cyclists are always lightly loaded—just a few changes of clothes and some snacks to keep them going during the day. They carry neither tents nor cooking gear. In such a harsh climate this strikes me as somewhat imprudent. We certainly like the freedom of being self-sufficient. These guys are all heading to Lhasa and can’t figure out why we’re not ,too! Oh if only the government would allow it. They were all amazed that such an ‘old lady’ could cycle such a high pass. I guess this was meant as a compliment. 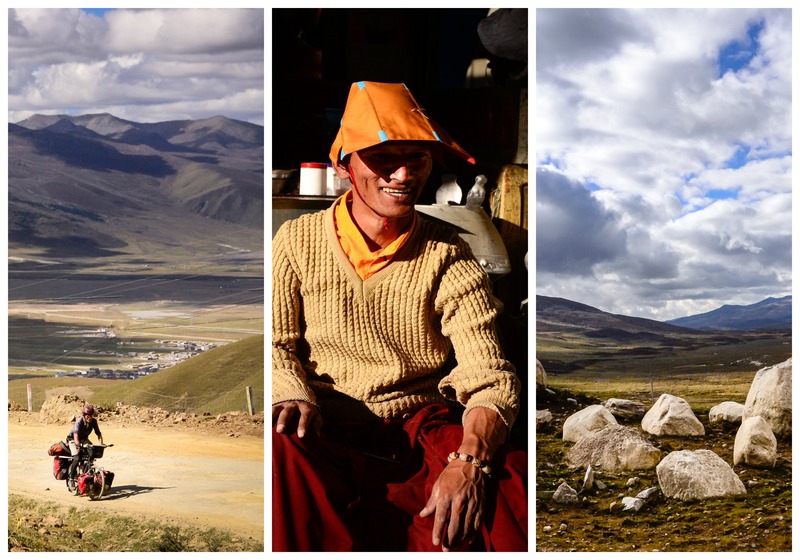 Distances between settlements on the Tibetan plateau can be long. More than once we’d spotted local cycle tourists zipping past long after we’d set up camp for the night. Now and then we’d spy a defeated soul slumped inside a mini buses with his bicycle strapped to the top. Spoke replaced, we charged on up the first big hill and whooshed down into the valley below. So high up, the mountains were mostly barren. This was a land of yaks and semi-nomadic herders. The sun beat down with an astonishing intensity and warmed the desolate land. 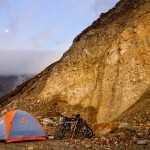 As soon as it slid behind a cloud, I’d start to shiver and dig into my panniers for an added layer of warmth. 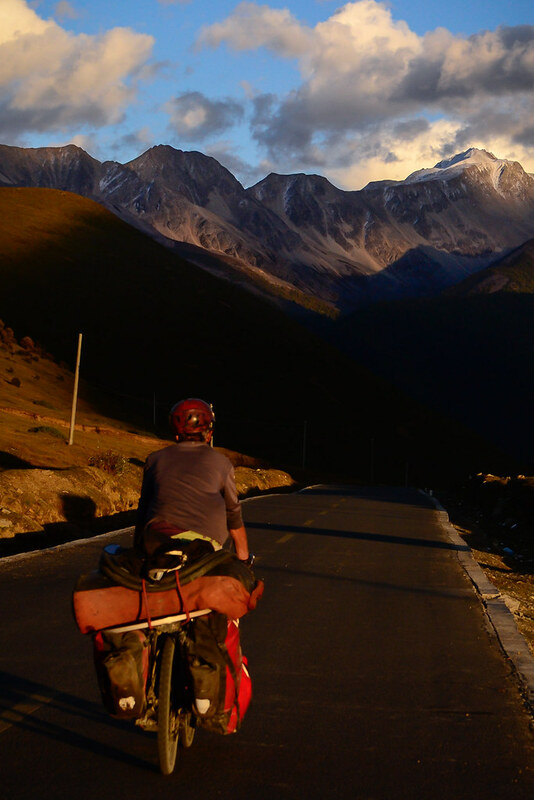 We cycled on determinedly wanting to make it up and over the first pass before nightfall. Our efforts were soon thwarted: another bike breakdown. This time the culprit was Eric’s machine. His gear shifter had busted. With technical assistance from yet another helpful construction crew, we were back on road—now seriously behind schedule. The light would be fading before we struggled up the final turn to the top of the first pass. 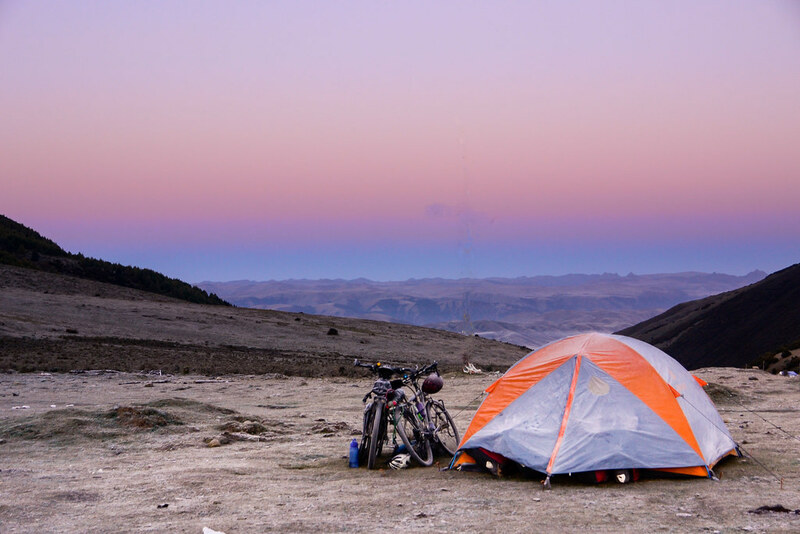 We’d set up camp on the windswept peak and retreat quickly into the tent as a light snow began to fall. I’d sleep soundly that night, confident we could take any challenge Tibet hurled at us. 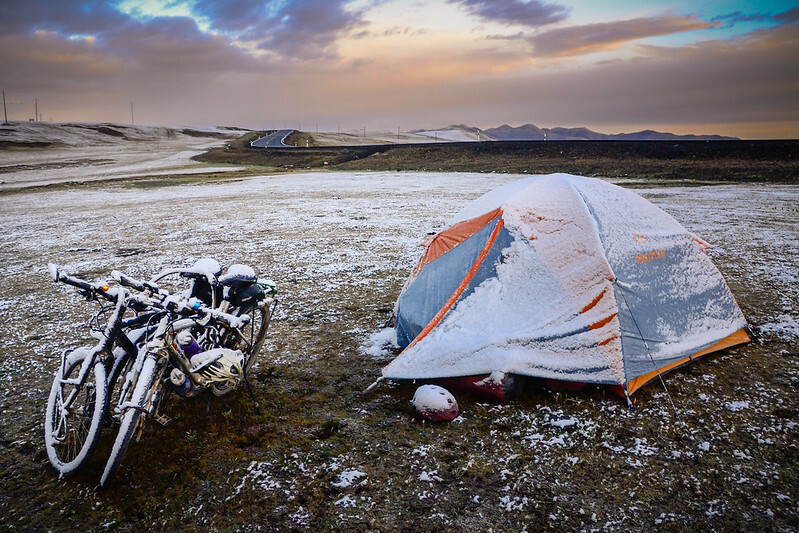 Nothing better than waking to a white world on top of the Tibetan plateau miles and miles from civilization. If only the road would remain this empty all day long. 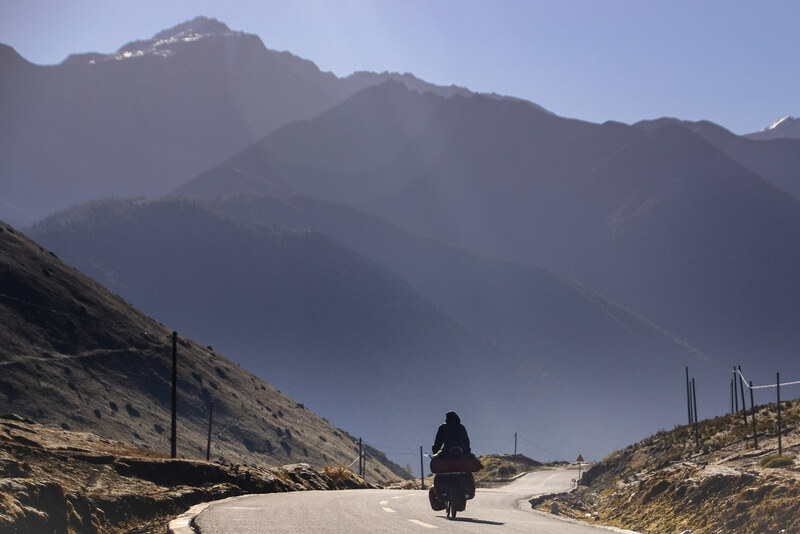 Alas, China’s burgeoning middle class has embraced the automobile and road tripping on the Tibet-Sichuan Highway is the thing to do. 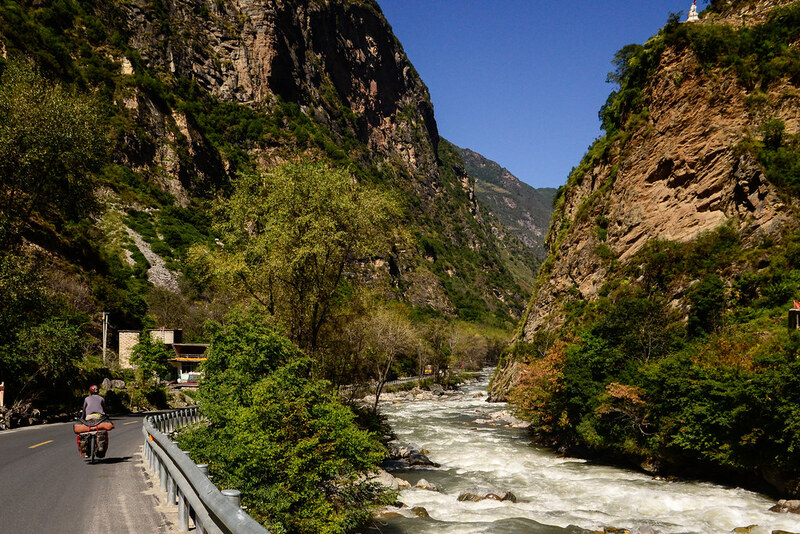 Sichuan’s emerald green hills are more menacing than they appear. 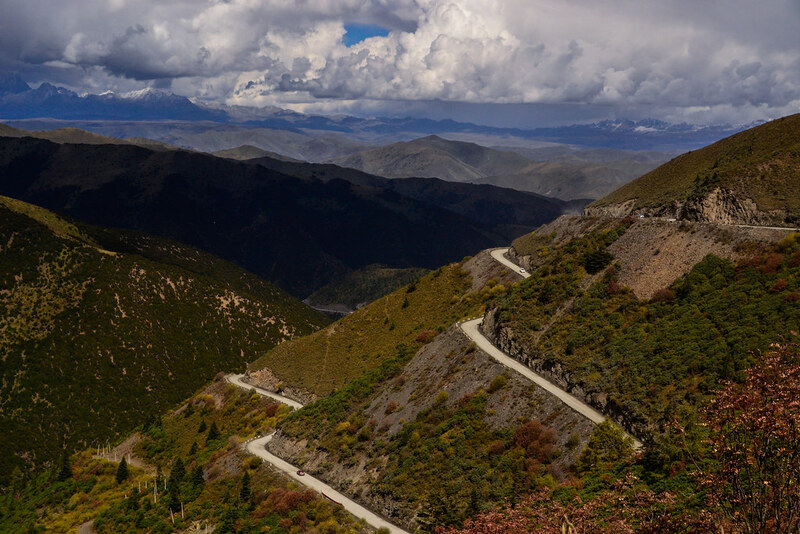 In theory, the Sichuan-Tibet highway is entirely paved. 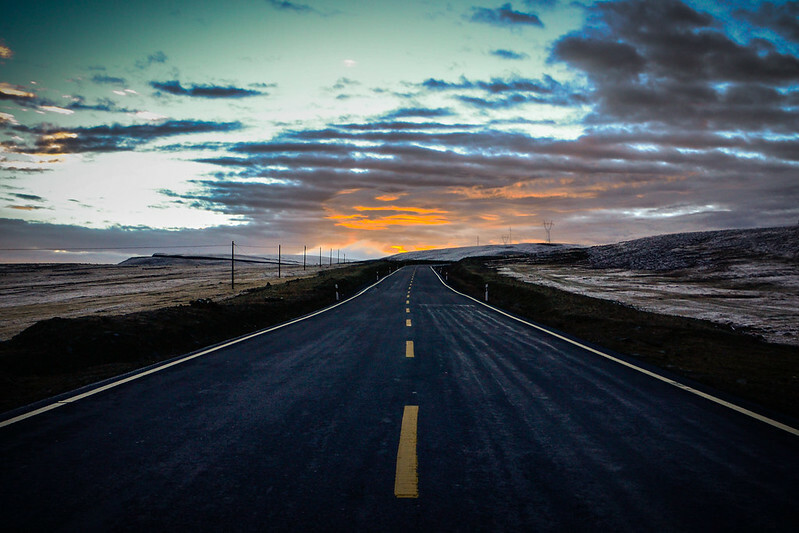 In the real world, there are long stretches of rough road. The government is blasting tunnels in several sections which means the upper part of many “old” passes has been left to deteriorate. Once the tunnels open and traffic is diverted the old sections of highway up to the top of the passes ought to be nice–rough, of course, but probably almost traffic free. 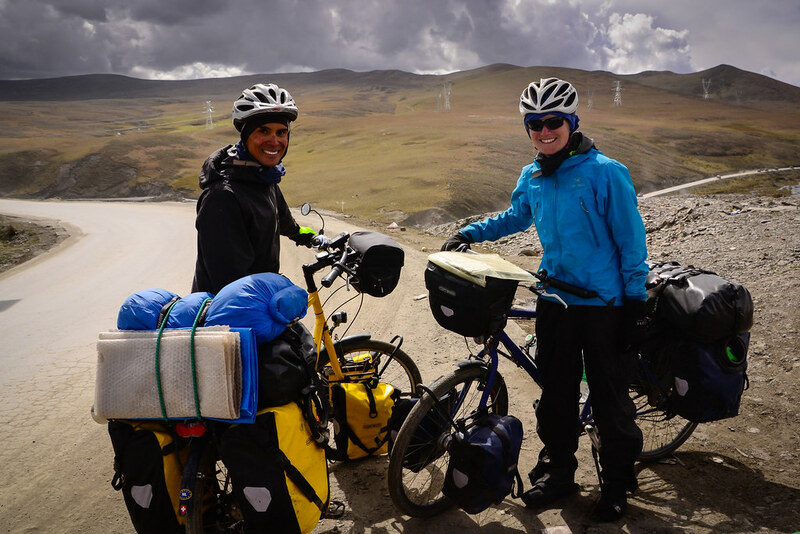 These loaded cyclists are Ivo and Sabine, a Dutch-Swiss couple who have biked across Europe and Central Asia and are now taking on China. Heading down the pass towards Xingduqiao. In the near future, a new highway will divert traffic from this pretty spot and you an enjoy the views without impatient drivers honking and hollering. 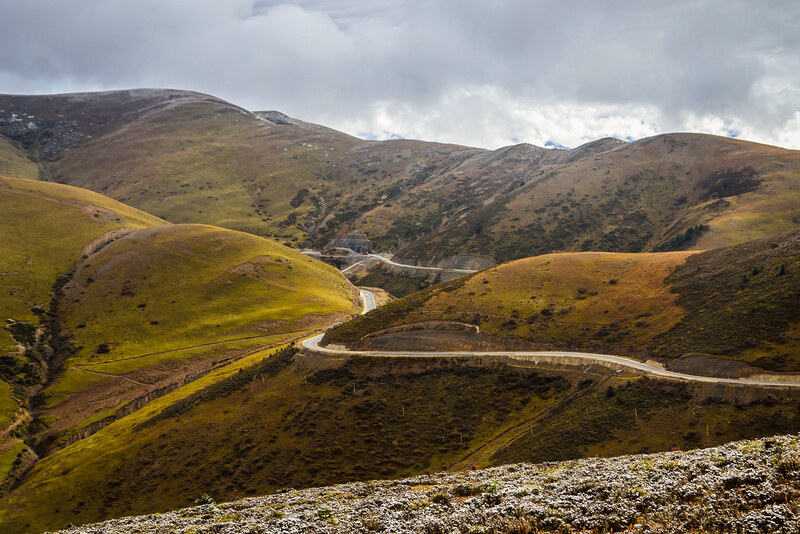 Three days and several painful passes out of Litang we arived in the picturesque Tagong grasslands.We even enjoyed some flat cycling along a roaring river with fabulous views out over the rolling hills. The only thing that marred our time was sharing the road with the hordes of Chinese tourists out for a Sunday drive. 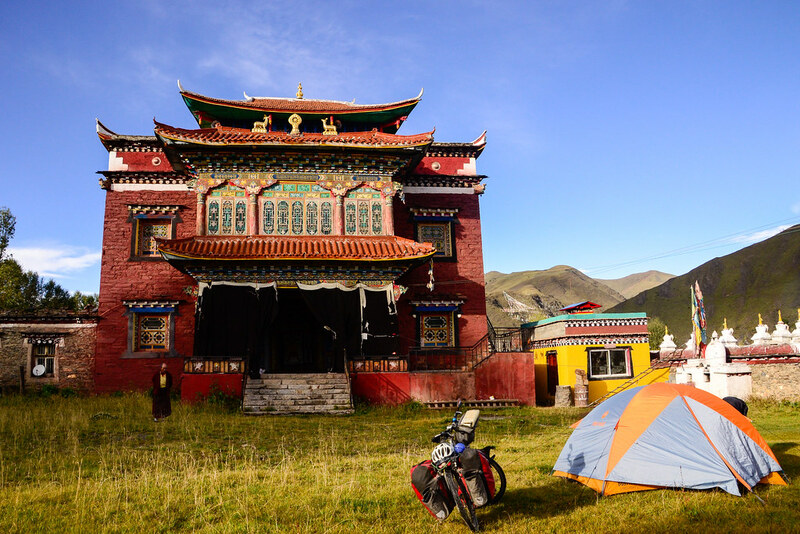 This shot is of the Buddhist temple where we were allowed to pitch our tent. Again, I was very surprised that we were granted permission by the monks. 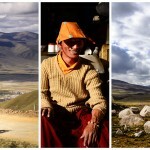 This is a 100% Tibetan area and the locals were taking full advantage of the onslaught of Han Chinese tourists. Women were hawking snacks (grilled meats and some tasty potatoes) roadside and families had turned their homes into temporary guesthouses to lodge the large numbers of holiday-makers. This was our next big pass: Yala Snow Mountain. Somehow we didn’t realize we had a pass to climb and we hit the top of the mountain just as the layer last bit of sunlight was hitting the peak. Luckily there was some level ground on which we could pitch the tent. Locals all herd yaks and it was lovely to admire the enormous animals milling around our campsite. Less nice were their steaming piles of dung. Sunrise from the top of Yala Snow Mountain Pass. We got a late start after spending time trying to dry out the tent. It was a bitterly cold descent. Cycling in the sun was fine but soon enough we found ourselves in a dark, narrow canyon and even 3 pairs of gloves couldn’t keep the cold out. Bracing ourselves for the chilly descent down Yala Snow Mountain pass. 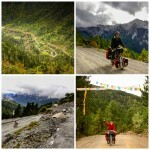 The road flattens and temperatures climb as we approach Xiao Jing. 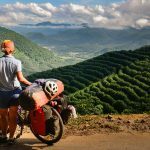 That’s not the end to our Tibet tales–one final installment will recount our ride up Balang Shan Pass. 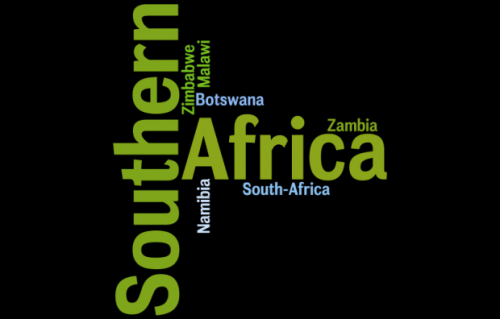 Comments are not working at the moment–hope to have the technical glitch figured out soon. Please head on over to the WorldBiking Facebook page to share your thoughts.